Cecil and Carl met in a Denver bar 44 years ago. When Carl entered a nursing home with dementia, Cecil became his guardian, making the partners ineligible for a Colorado civil union, legalized in 2013. 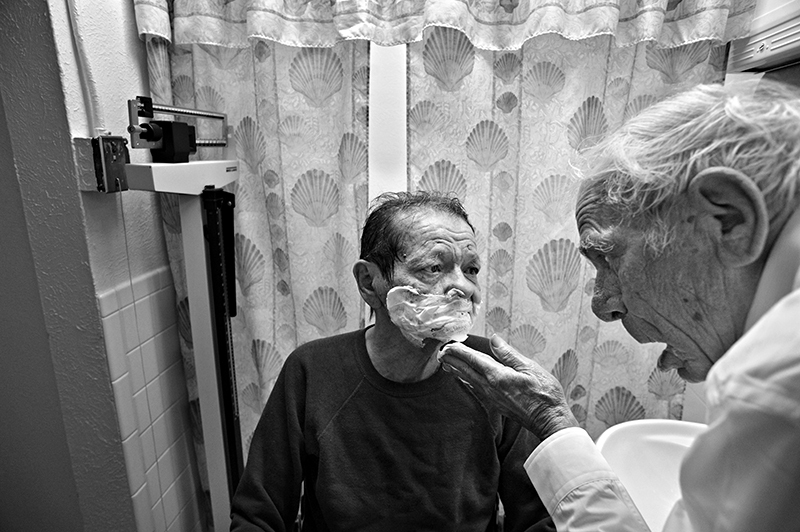 Cecil Bethea, 83, shaves his partner, Carl Shepherd, 72, during one of his many visits to The Spearly Center, where Carl lives, in Denver, CO. "As I remember in the old time wedding vows, there was a phrase in there, 'in sickness and in health,'" Cecil says. "Well this is certainly sickness. In December 2011, Carl had a stroke. He went to the hospital, then on to the nursing home. Carl has been diagnosed with dementia and since the stroke has not returned to the two-story home the pair had shared in northwest Denver since 1974.